Although water covers most of Earth's surface, nearly 30 percent of the planet is covered by land, sustaining a dazzling variety of life. Scientists might one day be capable of telling if distant planets are similarly covered by land, oceans and clouds by looking for reddish, bluish or grayish tints in the color of those worlds. Researchers have already developed maps of clouds on a giant planet orbiting a distant star. A great deal of research has shown that life has had a major impact on the evolution of Earth's atmosphere and oceans. Plants and other photosynthetic life generate oxygen, giving Earth the only known atmosphere in the universe with significant levels of oxygen. Life also greatly influences how much carbon is in the atmosphere and oceans in the form of carbon dioxide and methane. These greenhouse gases trap heat and can dramatically affect Earth's climate, which in turn has an effect on how much of Earth's water is frozen as ice. Oxygen can also indirectly cool Earth's climate by removing methane from the atmosphere — in fact, the dramatic rise of oxygen in Earth's atmosphere about 2.4 billion years ago, known as the Great Oxidation Event, may have cooled the planet enough to for it become a frozen "Snowball Earth." The investigators focused on biological weathering, by which life breaks down rock. This crumbled rock gets blown and washed away by wind and water, sediment that eventually makes its way to subduction zones, the areas where one tectonic plate of the Earth's crust dives or subducts under another. "When the Earth's surface is recycled in subduction zones, it affects processes in the deep interior," said study lead author Dennis Höning, a planetary scientist at the German Aerospace Center's Institute of Planetary Research in Berlin. 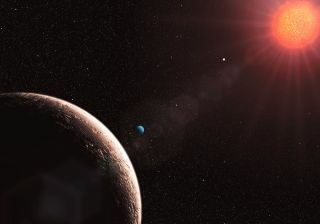 Scientists might one day be capable of discerning land, oceans and clouds on distant planets by looking for reddish, bluish or grayish tints in the color of those worlds. Above is a still image from the EPOXI mission showing the Moon transiting Earth. They are observed at different light wavelengths, which is why differences in details are visible. The first pictures of an Earth-like extrasolar planet will not be this detailed. "The biggest surprise for me was the pronounced difference we saw," Spohn said. "We hoped to see a difference, but we didn't expect to see such a big difference." Höning, Spohn and their colleagues Hendrik Hansen-Goos and Alessandro Airo detailed their findings online Oct. 25 in the journal Planetary and Space Science. The evolution of photosynthesis starting at least 3.4 billion years ago may have had an especially large impact on Earth's continents. Geophysicist Norman Sleep at Stanford University in California, who did not take part in this research, noted that biology could have other effects on Earth's interior. For instance, past laboratory experiments have shown that microbial activity can help transform the soft clay mineral smectite to much stronger and denser illite. Since illite is less permeable to water than smectite, microbial activity could make water more available at greater depths. Preliminary experiments that Spohn and his team conducted suggest this effect could enhance the difference between a life-filled and a lifeless Earth even more. Still, Höning cautioned that larger planets, such as super-Earth worlds up to 10 times Earth's mass, evolve in a strongly different way than Earth has, so these findings might not apply. Moreover, an exoplanet with a hot surface, a thick atmosphere or strong winds might also experience large erosion rates even without life. Future research can examine the tendency of cracks to form in sediment in subduction zones and the effects this may have on activity in Earth's interior, Sleep said. It can also investigate if volcanic activity at subduction zones varies with levels of sediment flow, Sleep added — with lava from volcanoes eventually building new land.